Bubble tea and Bao zi and a community of US-China bridge builders! We will be having our second (and final) Project Pengyou event for the year. 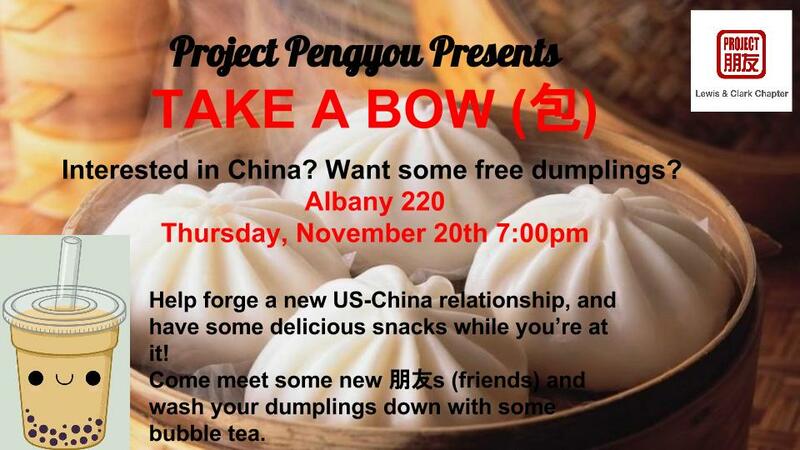 Join us for delicious 包子 (bao zi/ dumplings) and bubble tea this Thursday, November 20 at 7:00pm in Albany 220. This is part of a National Project Pengyou Day happening at over 50 colleges across the US in collaboration with the State Department’s International Education week. This is a great opportunity for Chinese/Taiwanese international students, American students studying Chinese, and all students who want to learn more about China to make connections. We will speaking English so don’t let your language level stop you from coming!